It has been a wonderful week of photography and I have been especially lucky with the light and weather. I was at Grand Canyon just as a snow storm hit. As the 3 hour storm moved on, the sun returned and the light was most special, the otherworldly storm sunlight that I love. Two days later I captured sunlight beams in the famous ‘slot canyons’ of Antelope Canyon and I caught a nice sunset at Horseshoe Bend. I spent several days at one of my dream locations, Monument Valley and the sunrise especially was fantastic but also the storm clouds the next day was something to see. On the way to Moab, Utah I experienced the great pueblo ruins ‘House on Fire’ in Mule Canyon. Then on to Arches and Canyonlands National Park, I knew little of them but they really delivered. 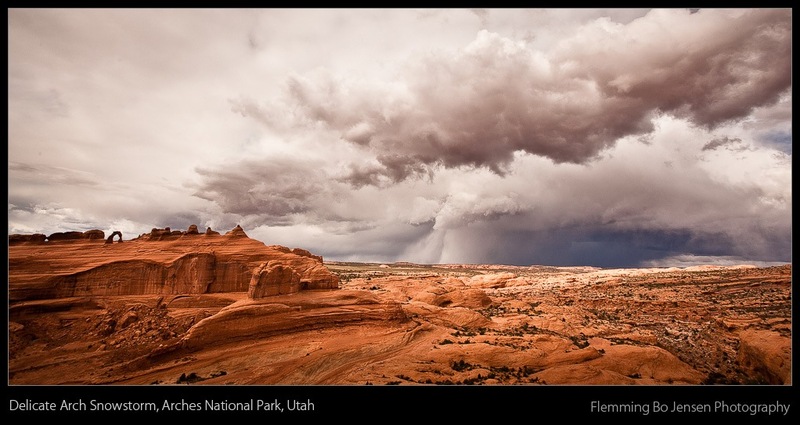 Canyonlands is more impressive than Grand Canyon I reckon and on both days I had fantastic clouds due to snow storms. A week of wonders and the landscape here in the southwest US is simply stunning. My perfect weather would be a hot tropical climate with Australian outback clouds (you know them when you see them) for sunrise. Followed by a clear sky for sun worshipping all day long! Then, energized by the sun, I should like a storm front to move in with some otherworldly light and dramatic clouds. Keep the sun exposed though so it can light up the clouds at sunset. Then, post dusk, clear the sky again for some star trail shots and keep the temperature warm all night for nighttime shooting under a full moon. Too much to ask? Having chased snow storms for two days in Arches and Canyonlands I had my shots and could take the cold no longer. There was frost on my car this morning, now that does not work for me! So I have moved south again, to Lake Powell in Page, Arizona, where it is warmer. Bryce Canyon, Death Valley, Yosemite etc. coming up! I look forward to Death Valley, my kind of place and my kind of temperature. It is 1.30 am and I find myself in Moab, Utah. And it is probably a bad time for blogging but sleep escapes me tonight. I went to bed at 00.15am and then proceeded to have a strange dream and woke up instantly. So here I am; Wide Awake in America. I am a little tired of sleeping in strange motel beds, but the landscapes here are stunningly magical. Every day as I drive through the Southwest I am continually surprised by how beautiful the land here is. Earlier today I had a bit of a blissful being in the wild moment. Going by directions received by fellow photographers I found the trailhead to Mule Canyon in Utah, the trail leading to House on Fire anasazi ruins. A location I really wanted to visit. I hiked the mile and a half along the wash in brilliant sunshine and arrived at the ruins with plenty of time to shoot them while they are still in the shade. I was somewhat ecstatic that I have found them. They must be in the shade for the ‘fire’ effect caused by reflected sunlight onto the rock above the ruins. The effect is quite simply surreal and really spectacular when photographed at just the right angle to catch the reflections. I shot every conceivable angle and then sat on a rock worshipping the sun for an hour. Just me and not a soul around me and not a sound. Being there. In the moment. In nature. Truly content not wanting to move. Later I arrived in Moab, Utah and checked into my hotel room. I drove to Arches National Park to shoot the sunset. There is a sand storm blowing but it is still nicely warm. Just as the light show is about to happen Mother Nature drops a large cloud in front of the sun, but the clouds are still great. 17mm wideangle pointed almost straight up with just some gorgeous red rocks in the foreground and I have my shot. I steer my black spaceship back to base. It has been one of those days. Days on the road. From magical moments in America’s nature to waking up in a motel bed, an inner as much as an outer journey. That sums up the present life of this travelling photographer. An image that sums it up? Well, since I am saving the hero shots for my new website, here is what I really love about this US road trip. 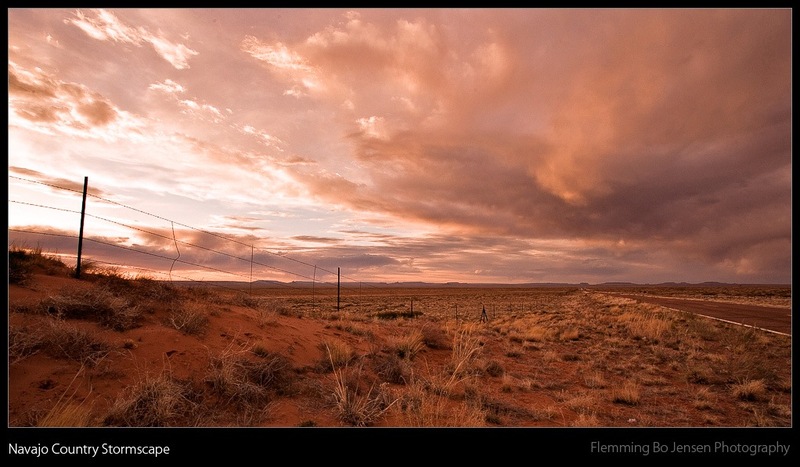 Simply driving down a back road in gorgeous Navajo Country, Arizona and shooting a dramatic cloudscape at sunset with a storm approaching over the red soil. A bit of magic for just a few minutes, what this is all about. (There is a stitched version of this that will be the final version, this is is a quick preview). “There’s a storm coming” says the boy. “I know” says Sarah Connor at the end of one of my favourite movies – the sci-fi masterpiece The Terminator. Standing at the harbour shooting this and watching the storm coming with not a soul to be seen anywhere I felt like saying another favourite Terminator quote “There’s not much time left in the world”! The shot is 6 vertical images stitched in PTgui. I used a neutral density filter to lengthen exposure but then forgot I had the iso at 200…bugger! I wish the 5D would display iso in the viewfinder! The original shot had a sky that was more bluish and purple but I didn’t really like this colour and felt it didn’t go well with the orange colour of the sunset. So I desaturated most of the blues and cyans and then added a bit of a dark brown gradient fill layer to the clouds just to warm the gray clouds slightly. I feel the orange and black go much better together here. As the finishing touch I used my Wacom tablet to paint some light onto the buildings and added a couple of vignettes in Photoshop. 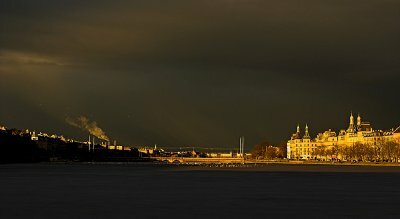 The end result is a dramatic stormy cloudscape view of Copenhagen – Judgment Day style without the robots though! The month of May brought us some incredibly good Spring weather, 347 hours of sunshine (a new record) and temperatures up to 29,5c degrees. I know, a chilly day in the Australian outback but it’s all relative as someone once said. The month of May brought very few photos though, sunshine from a clear blue sky lends itself well to trips to the beach but not to my style of photography – dramatic and special light! I love Summer but also need some drama light to keep my photography fix going (I’m an addict). Like always, I want everything! My new favourite saying: I want patience and I want it now! It’s the sort of shot that gets better the bigger it is but I hope you still get a sense of how awe-inspiring the light was. It’s also somewhat otherworldly and I feel like doing a version with a UFO in there and Scully and Mulder in a boat on the lake – the truth is out there! I have more photos to come from this X-Files cloudscape night so maybe the next one will feature an Unidentified Flying Object! This shot was developed in the beta version of Adobe Lightroom 2.0. I have recently started to use this as my RAW development tool and I must say I like it a lot and I like it a lot more than Lightroom 1.0. They fixed a lot of the things that annoyed me in 1.0 and added some incredible new features. Adobe purchased the Danish company Pixmantec and their product Rawshooter a short time before 1.0 was released but had no time to incorporate features etc. into Lightroom 1.0. With 2.0 I think the Pixmantec boys have had a lot more inputs and Lightroom 2.0 really feels like a lot more like a mix of the best of Rawshooter and Lightroom to me. I really like it and reckon Lightroom 2.0 will be my new RAW developer of choice. I did almost everything in Lightroom including the vignette effect, I only used Photoshop for sharpening and very little healing and painting with light. I still wish it was faster and more responsive, Rawshooter runs rings around Lightroom in terms of speed! “Everywhere you go – always take the weather with you” goes the classic song from aussie band Crowded House and so far I have done just that. 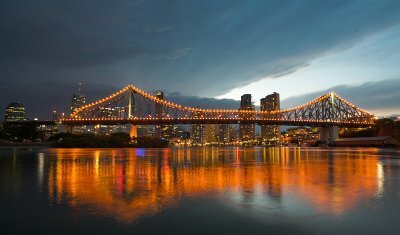 The first day I got to Brisbane it was cloudy, windy and only 22-23 degrees (bloody freezing cold when you come from tropical Cairns!). The next day it was warm and sunny and as Spring has really hit Brisbane the temperature and humidity has gone up every day since with some 33-34 degree days! So I have indeed brought the weather with me. 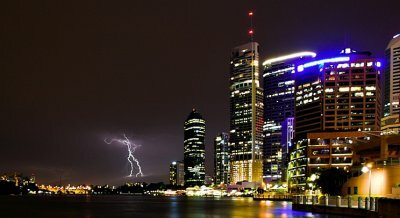 Spring in Brisbane has added something I didn’t bring: thunderstorms! 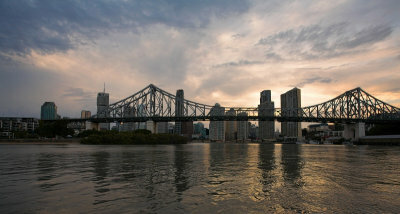 It’s a natural part of Spring in the tropics and the last few days have brought some impressive storms late afternoon and some much needed rain for Brissy. 6.03 pm – a storm definitely on it’s way! 6.10 pm – storm is here – run Forest, run for cover now! The shot at 6.10pm was shot just as the rain was coming – I ran for cover and made it to the Eagle Street Pier just as the very heavy rain hit. It was a fairly impressive storm; it raged for about 30 minutes and then it was gone as quickly as it appeared. It was heaps of fun chasing and shooting it, from where I shot I knew I could get to cover in 2 minutes so no worries. Also very cool to get shots with actual lightning in it, a first for me. I know it’s not the worlds largest bolt of lightning but hey it’s there and I captured it and feel I can now add ‘Stormchaser’ to my business card! 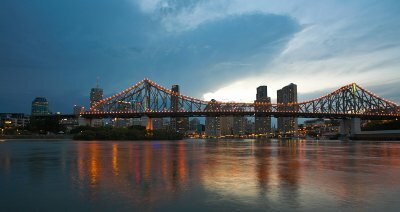 There are a few more new Brisbane shots in my gallery. My hair was fairly long when I got here, it grows fast as it is and I think the sun here helped it even more (and bleached it as well). So it was longer than ever and I had two choices: get a haircut or buy a surfboard (to go with my long bleached surfer hair). I opted for the haircut. Now; of course I made the mistake of saying the words “it’s too long; you can cut a fair bit off” to a hair dresser ‘cos they just love doing very short David Beckham style cuts and I am no Beckham. Bugger! Now it is too bloody short. I should have gone for the surfboard. Grow hair, grow! I take credit for this one 🙂 I know I probably didn’t invent it but I’ve used it heaps especially at work!